Palm Arts presents the 2019 Classic Cinema Series celebrating the 50th anniversary of the movies of 1969. The Classic Cinema Series films will be presented on the big screen with full theater sound at the Michael D. Palm Theatre in Telluride, Colorado . Admission is FREE with all donations benefit the Palm Arts Programming fund. The series begins with John Wayne’s Academy Award winning performance as Rooster Cogburn in the classic True Grit , filmed partly in Ouray County, on Friday, January 18th at 7:00pm. 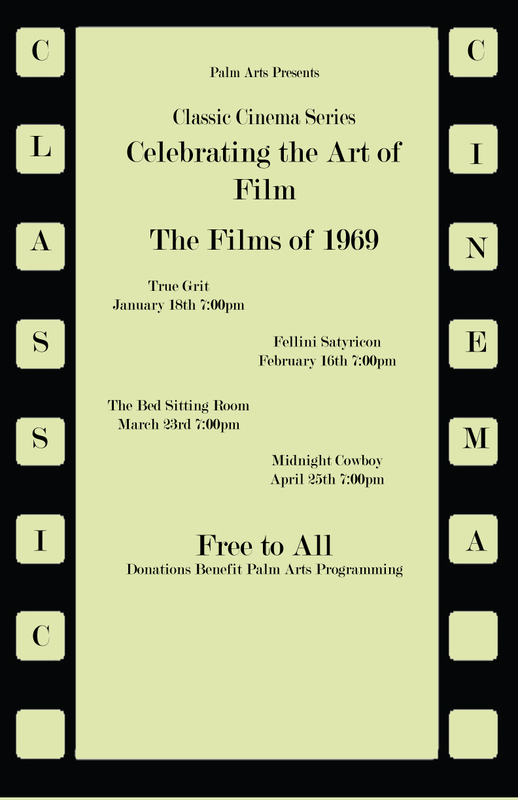 The film series will continue on February 16th with Federico Fellini’s Fellini Satyricon, March 23rd with former Telluride resident Dudley Moore’s dark comedy The Bed Sitting Room and conclude April 26th with the 1969 Academy Award winner for Best Picture Midnight Cowboy . More information on the film series and other Palm events can be found at www.telluridepalm.com.